The 3D converter essentially provides functions to facilitate the use of 3D models of other software products. 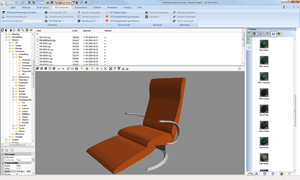 Furthermore, existing models can be loaded, edited and stored in other formats. Therefore, it is aimed at all users who have 3D models, are able to create or obtain them, and for users who wish to use the cadvilla software for their work in addition to the other 3D visualization applications they normally use.